Today I am flashing back to some early childhood memories and my obsession with My Little Pony! I've always been a collector of one thing or another, even now I have a make up collection of limited edition bits and bobs that are so pretty I would rather look at them than use them! The top is cropped so I have worn it over an Asos Curve mint dress and paired it with my Simply Be pink jacket for a nice pastel look. I've even dug out my baby pink Barry M lipstick that I used to wear religiously circa 2012. The sleeves are ok on the top, they are about half way between cap sleeves and quarter sleeves but I much prefer wearing it under a jacket or cardigan. I have accessorized the outfit with a couple of friends, how awesome would they look made into a bag?! I also have my new favourite rose gold pumps from Dorothy Perkins on, I picked these up in a charity shop for £4 and have been wearing them all the time! I can't recommend charity shops enough for hidden bargains and I like that you can't predict what you'll pick up, it adds to the fun! I think this look works quite well for a cutesy 90's sort of outfit, it's a little bit different from my usual floral dresses so should hopefully add a bit of variety! What do you think? Do you like tshirts of old school tv programmes for a trip down memory lane? Let me know below! This post brought back so many memories! I used to love My Little Pony! where did you get the big MLP's from? Love this! Such a cute outfit... and I LOVE My Little Pony. 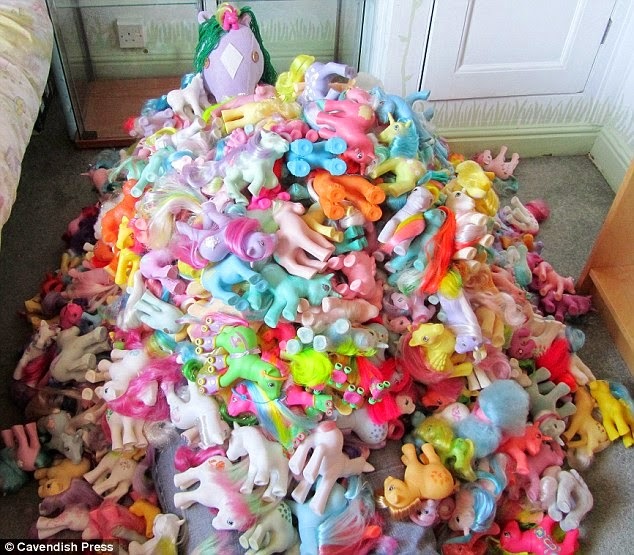 Oh I love my little ponies & use to have a similar pile of ponies too lol!